November Challenge Week 4 » What's Under the Needle? 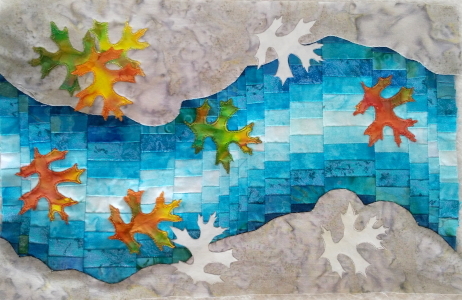 To complete my piece I wanted to add some quilted leaves. 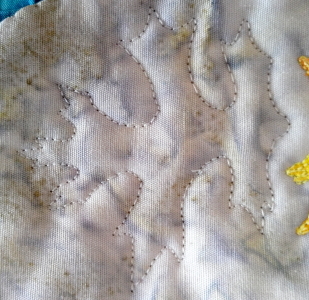 I used the same leaf design and made a freezer paper template to stitch around using free-motion quilting. I drew three and cut them out then used them to get an idea of placement. 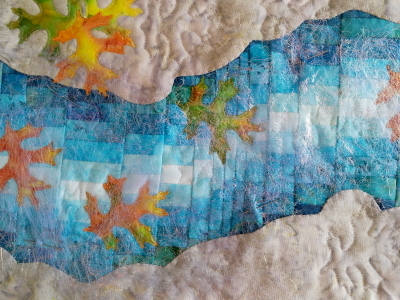 After a bit of 'warming up' I went about quilting my first leaf. 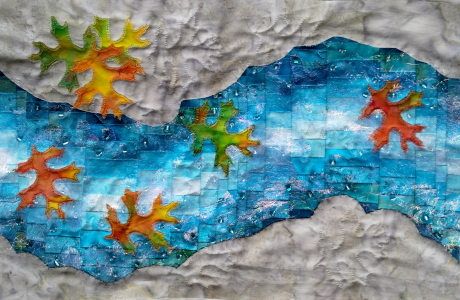 I added several more both on the river bank and on the Bargello river. 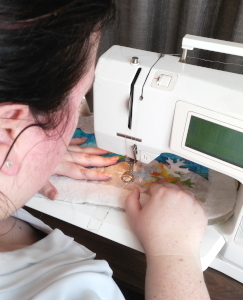 Mum snapped a photo of me busily quilting on her machine. To add some further interest to the piece I wanted to add some beads but before doing so I asked mum what else could be ued to enhance the water. She suggested Angelina fibers. This is the first time I have ever worked with this. Mum had a few to choose from - I found a very pale blue one that I thought would work well. 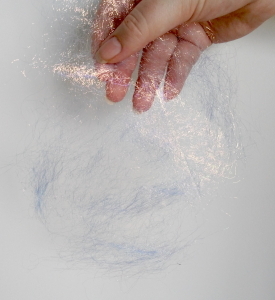 I didn't want it too thick so just used a few fibers placing them between two pressing sheets and then gently pressing them to bond the fibers together. 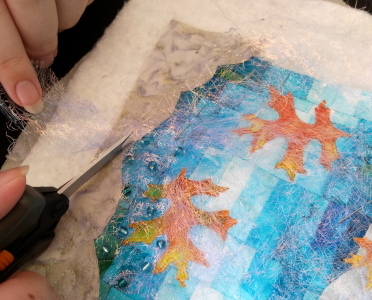 I place the bonded fiber over the water section and pinned it in place. 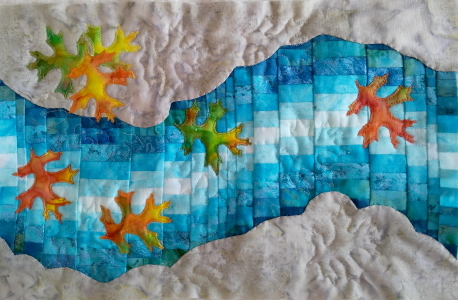 Mum said it would have been better to do this before I did the applique and quilting so that's something to remember for next time. I will use the beads to hold the fiber in place and then trim along the river banks and leaves so the fibers only cover the water area. Just a few more beads and the final trimming and I'm complete! So pretty! Very nice challenge. I would have joined in, but I had company for our holiday and had no time to slow down and sew!